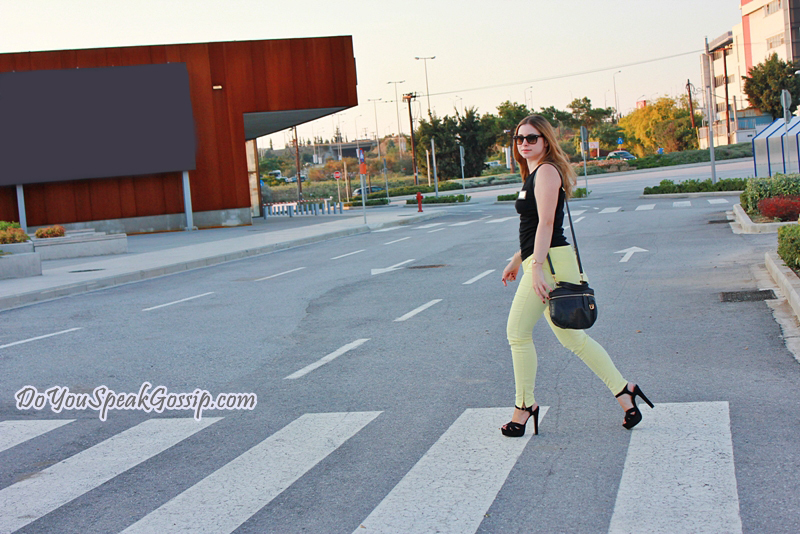 Black and Yellow | Outfit post - Do You Speak Gossip?Do You Speak Gossip? We took these photos a couple of days ago, when we went for a walk, and then returned home to watch a movie the way we like: privately. This time we watched In Time, a sci-fi action movie which had a bit weird plot, but in the end we really liked it. You should check out the link, if you’re interested. You may remember the place of these photos from my post Neon Love, a post I really enjoyed taking pictures for, because there was nobody around to stare at me, when taking the photos. We went there again, for this post, but we were asked to leave after a while, as it’s forbidden to be there without permission, so we continued the “photoshoot” at another location. Bye bye favorite place for outfit shots. You’ll be missed. Black top: Dolce & Gabbana, yellow top (underneath): Zara, jeans: Zara, bag: D&G, sandals from Spartoo.gr: Buffalo Dasia c/o online shop spartoo.gr, sunglasses: Ray-Ban Folding wayfarers, watch: vintage, cuff bracelet: H&M. These shoes have become one of my favorite pairs since the day I got them. They’re really comfortable for their height, and I just love them. They have already been saved as part of my Shoeper Shoe Challenge by Shoeperwoman.com, with this outfit. This outfit is dedicated to my bf and photographer of the day, who’s helping me more and more every day and has taken many of my outfit photos lately. I wouldn’t be here, playing the blogger, without him and his precious help. Thank you so much T.
This song reminds me of him, and the title of this post is obviously inspired by it. very pretty colour combo! awesome pants! Hi there! Love this combination, those jeans are really nice. The black gives an elegant yet sport touch. I think you lost weight, looking very fit!!!! Εντάξει τα αγαπώ τα παπούτσια σου…πανέμορφα! The jeans are such a fun color! Thank you! I bought them this spring and they are really comfortable. I wore them a lot this season. I am goning yo steal your shoes!!! They look so good with the contrast of yellow! Amazing look dear! Helloooooo! I am sorry, I have been having some computer problems and today I have to go to London, so sorry I couldn’t comment before! But I swear I didn’t forget you! I took a look at the other posts and I looooved the cherry outfit!!!! The color goes so well with you!!!!!! You see, I am in a hurry – again… must take the train… but this is just to tell you I arrived well and that I didn’t forget you and that I hope everything is fine with you and your mother! Please do have a great weekend!!!!!!!! Hi Denise! It’s so nice to hear from you again! I’ve missed you a lot! I was wondering if everything was ok. I didn’t see any new posts on your blog, but I stayed positive. I know you needed some rest after your trip. Don’t worry, about the comments. Thank you so much for checking out my previous posts as well. I was waiting for you to comment, because I want to tell you some news as I told you before you left for England. I’ll send you an email asap to tell you the details. I’m glad that you arrived well, and that you’re fine. We’ll talk again when you’ll have time. I know how it is when you’re traveling to London for the weekend. I hope you have a great time there with your friend, after so many months that you didn’t see her. Filakia polla! I’ll send you an email really soon. Kouklitsa gi akomi mia fora!!! Mou arese poli o sindiasmos…zileuo tin zesti sas kouklitsa, edo exoume pe8anei apo to krio!!! Me mpoufanakia eimai i kaimeni, apo tora! Perimeno na ma8o ta nea sou…sorry pou xa8ika, alla logo panepistimiou dn vrisko k idiaitero xrono oute g ton eauto m pleon! Filakia polla polla! S’euxaristw para poli Christina mou! Min anisixeis! To ektimw afantasta pou erxesai sto blog mou, ap’tin stigmi pou den exeis poli xrono…S’euxaristw poli! Kai egw diavazw panta to diko sou, alla polles fores den exw xrono na afisw ta sxolia mou….Exw kai egw treximata ton teleutaio kairo! Hey Stevie! I came to your blog today, but it was impossible for me to leave a comment, since the only option enabled is to leave comment with a Google account, and I don’t have one. I just wanted to say that I loved the necklace in the first post and many of your other jewellery! I browsed through your blog, and I really liked your work. You’re really talented! 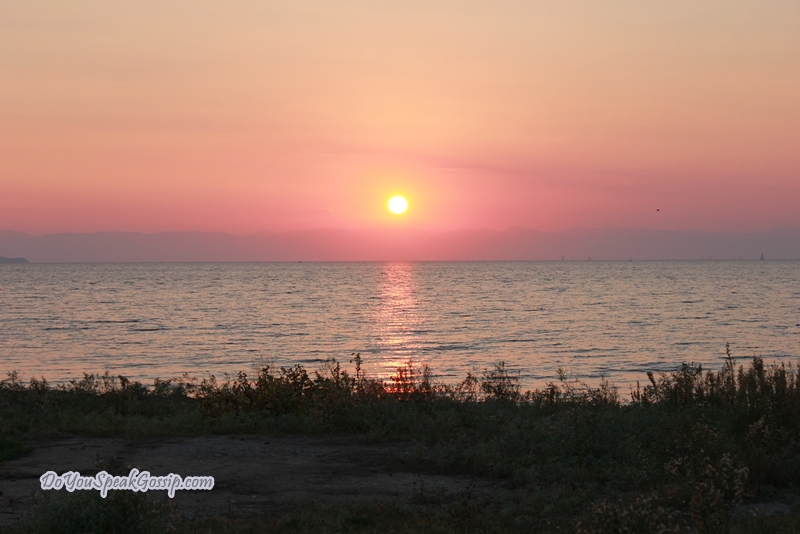 Thank you so much for commenting on my blog! Wish I could comment on your blog, as well. Maybe you should enable some of the other options too. you look amazing m, def lost some weight (i’m so jealous haha) really like this outfit, and the colour of your hair!! Thank you Stephanie! No need to be jealous, you have a great body, and you’re definitely much thinner than me. 🙂 I really like the color of my hair here as well, they look kind of red. And I’m flirting with the idea of becoming a redhead for years. Maybe it’s the right time. Although I’m afraid of changes, and I’m not sure I’ll do it in the end. I’m jealous of your willpower! 🙂 I think you should definitely go red, you have the right complexion for it!! Ωχ! Φοραω και εγώ τα ίδια χρώματα στο τελευταίο μου post! Χαχα! Το παντελόνι σου είναι super fit και σου ταιριάζει απόλυτα! Τα πεδιλά σου θεϊκά! Μπραβο και πάλι για ένα άψογο look! hehe Great minds think alike! To eida to teleutaio sou post kai einai teleio! S’euxaristw para poli glikia mou Elsa! Αλλά και το μετά αξίζει! Το ηλιοβασίλεμα είναι καταπληκτικό! Pingback: Moments of my life | Do You Speak Gossip?